This post focus on how to renew BMW FEM/BDC by Auro IM600. and write it into the replacing module. 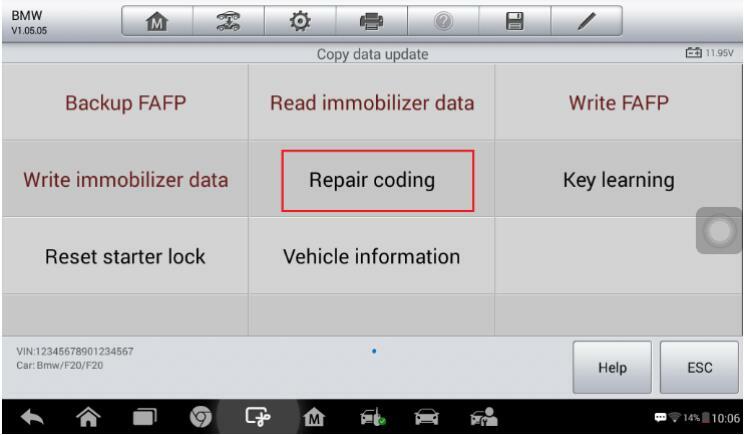 the information via the input VIN code, vehicle frequency and engine ISN codeand then write it into the replacing module. 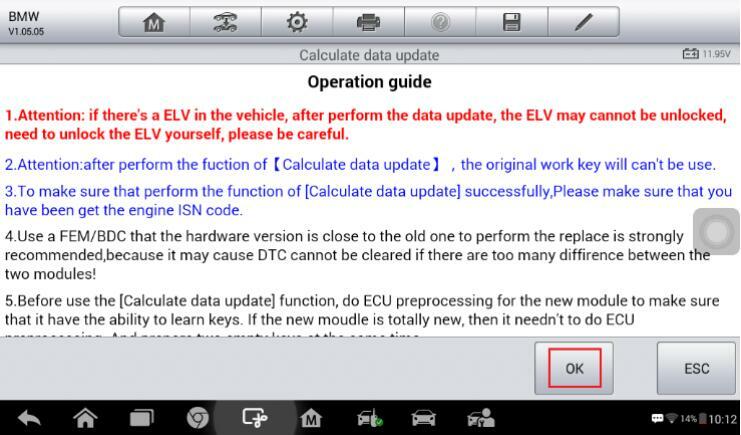 1.Attention: If there’s an ELV in the vehicle, the ELV may not be unlocked after performing FEM/BDC Renew. 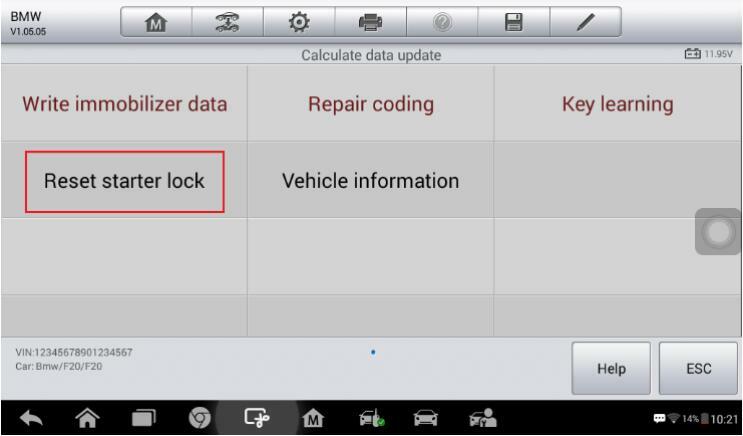 You’ll need to solve the locked problem yourself, so please start the operation with careful consideration. 2.To perform the Copy Data Update function, a working key or the engine ISN code is needed. 3.The hardware version of the original and replacing modules can only vary slightly. Otherwise, the DTCs of the vehicle may not be cleared. 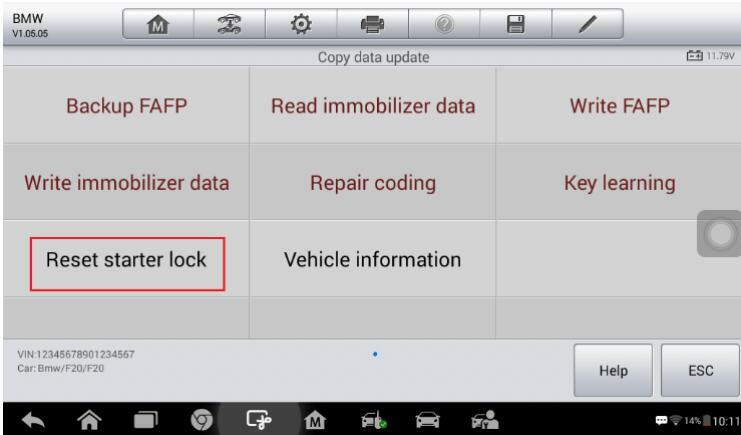 4.Remove the FEM/BDC module from the vehicle. 5.Conduct ECU preprocessing on the replacing (used) module and the original module to make them able to learn keys. 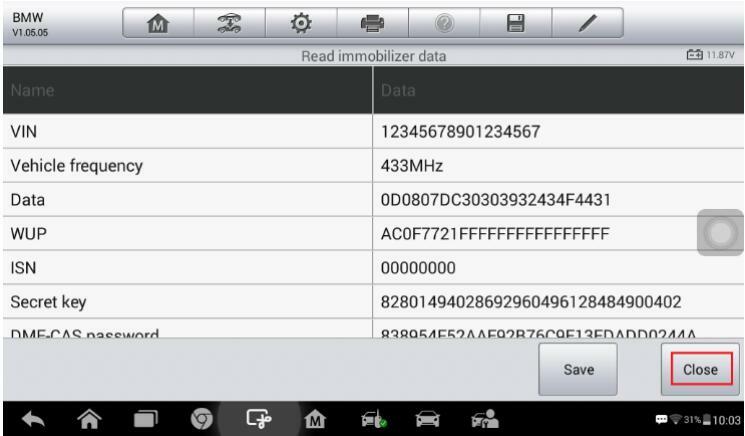 No ECU preprocessing is needed for the replacing module if it is a brand new one. 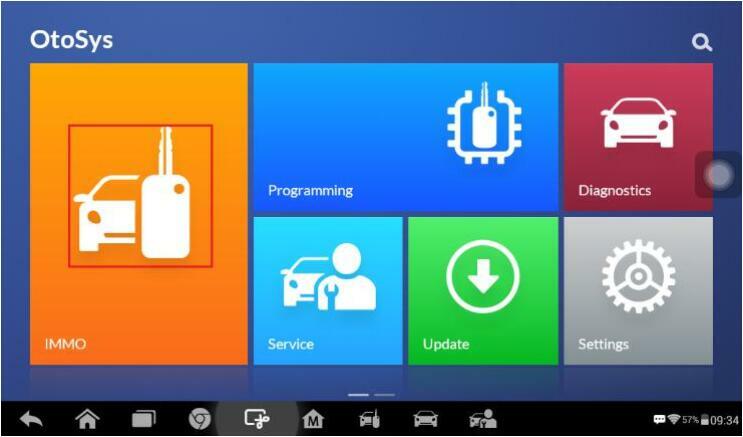 1.Connect the IM100 tablet to the original FEM/BDC module via the included main cable. 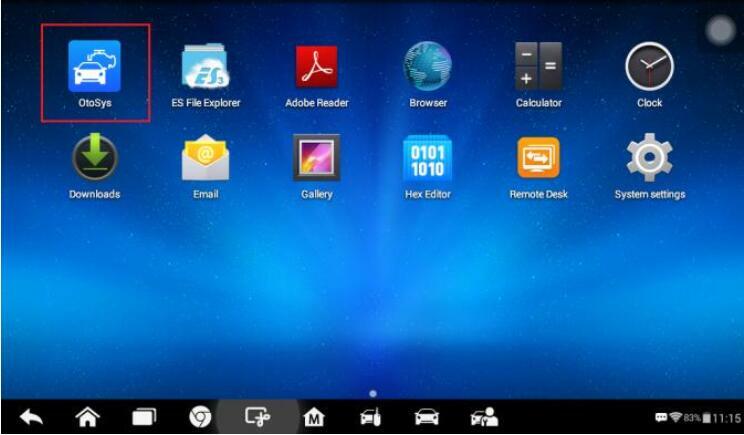 2.Turn on the IM100 tablet and tap OtoSys > IMMO. A vehicle menu displays and a disclaimer prompts up. Tap Accept to continue. 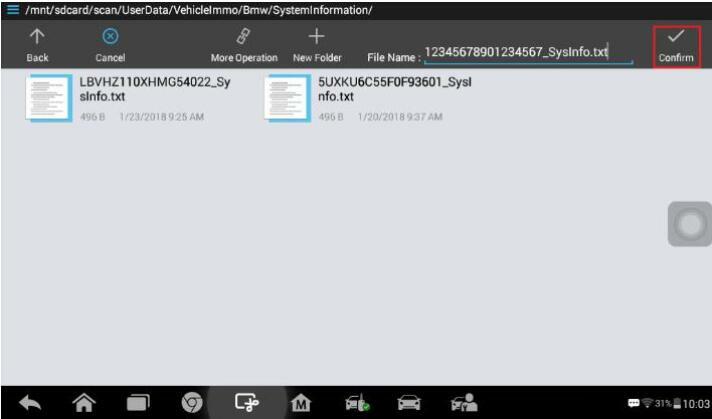 3.Tap BMW on the vehicle menu. 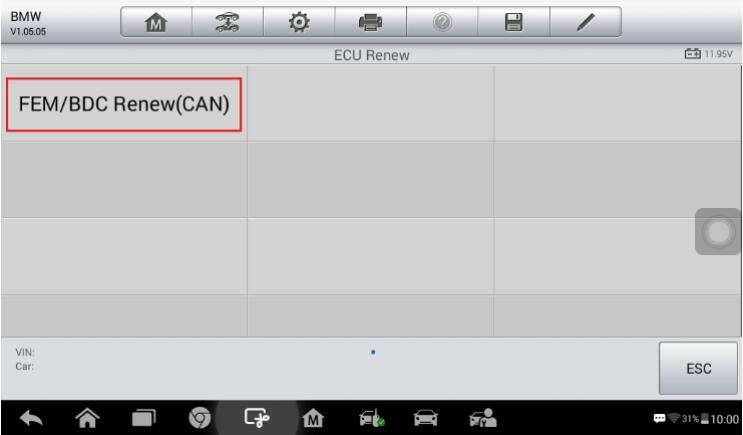 4.Tap ECU Renew > FEM/BDC Renew (CAN). problem, so that our engineers could help. 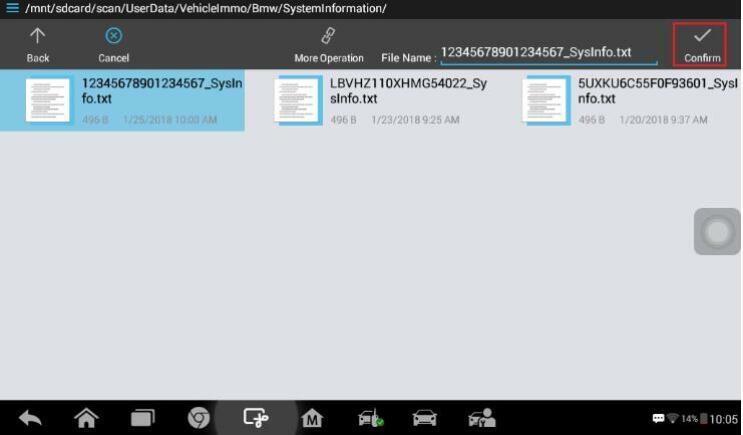 The network should be connected when uploading the data.Please make sure the engine is off before the operation gets started. 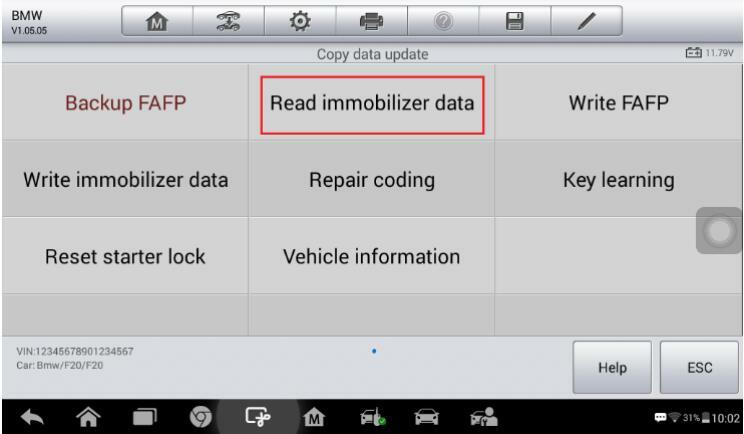 5.Tap Copy Data Update, read the notes and procedures listed in the operation guide carefully, and then tap OK to continue. Note: If you don’t strictly follow the steps, the data may be lost or the FEM/BDC Renew operation may fail. 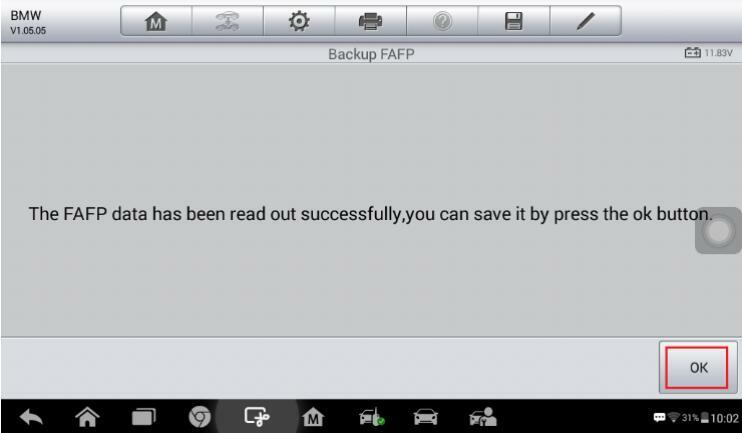 6.Tap Backup FAFP on the function menu to backup the FAFP data of the original FEM/BDC module. Read the function information and tap OK to continue. 7.Tap OK > Confirm to save the data. When a “File saved successfully!” message displays, tap OK and exit to the function menu. Note:The data file can be renamed.Memorize or note down the name and location of the file for later use. 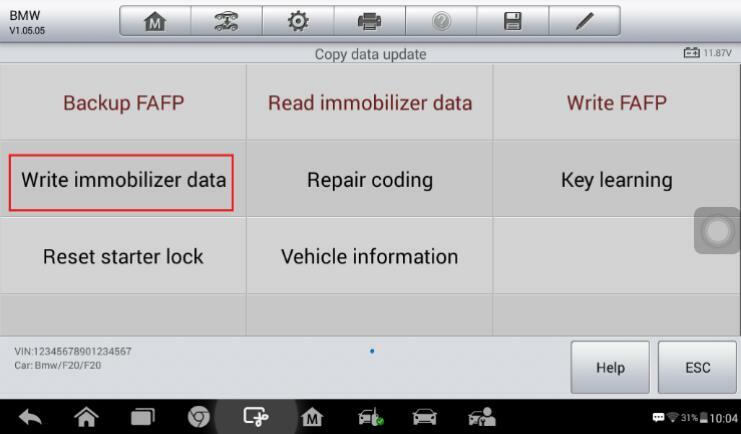 8.Tap Read immobilizer data to backup the immobilizer data of the original module.Read the function information and tap OK to continue. 9.When a “Do you have a working key?” message displays, make selection accordingly. 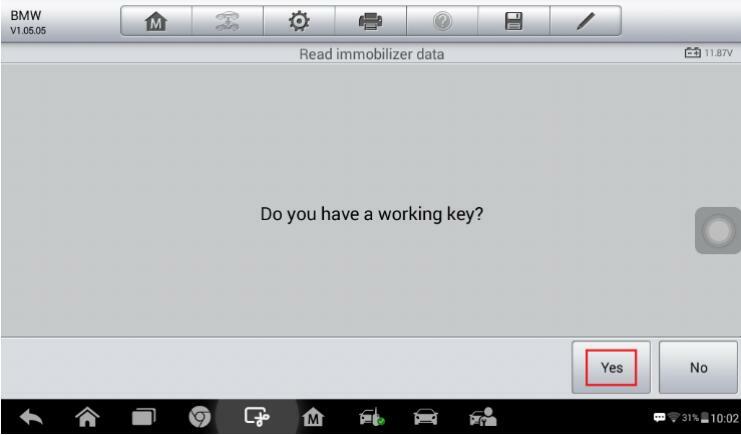 Tap Yes and then put the working key close to the emergency start coil to read the password information, or tap No and move on to read the immobilizer data. Note: If the working key is verified in this step, it can be directly used to start the engine when the FEM/BDC Renew is completed. 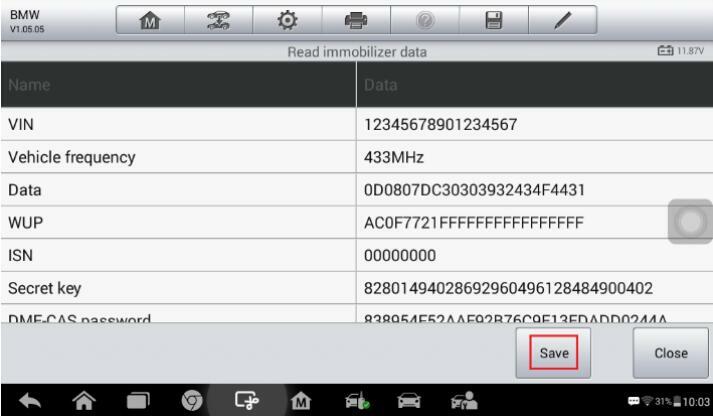 10.When the immobilizer data is read successfully, tap Save > Confirm to save the data. 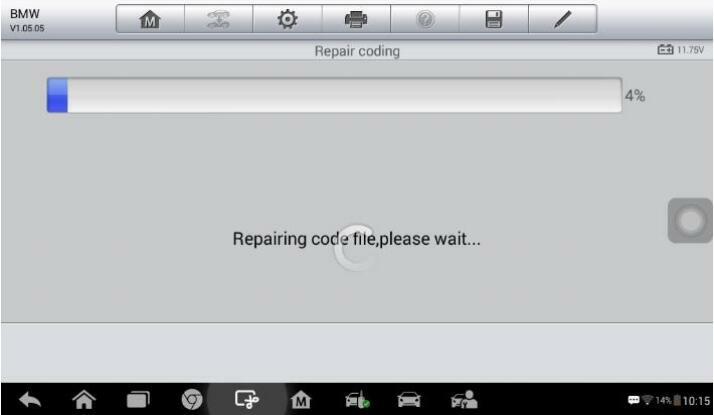 When a “File saved successfully!” message displays, tap OK > Close and exit to the function menu. 11.When Read Immobilizer Data is completed, connect theIM100 tablet with the replacing module via the included main cable. 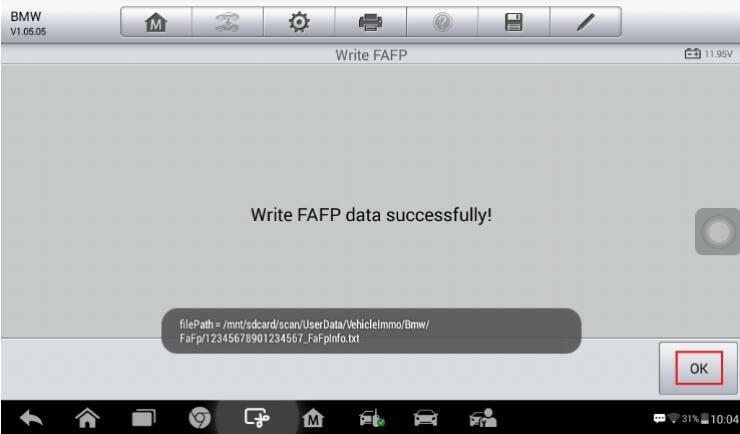 12.Then tap Write FAFP to write the saved FAFP data into the new FEM/BDC module. Read the function information and tap OK to continue. 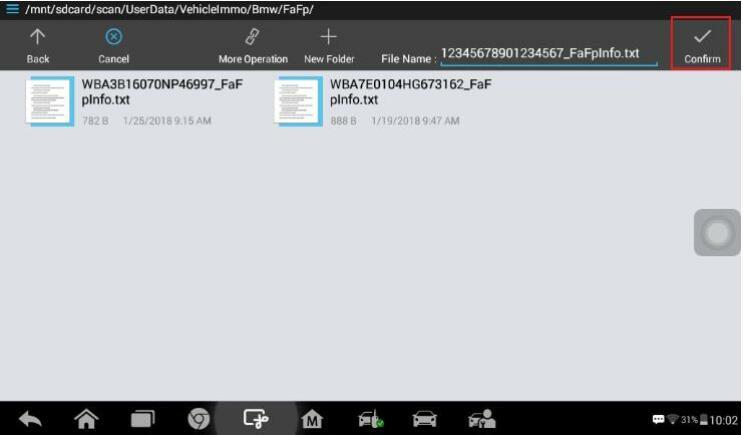 13.Select the saved FAFP data file and tap Confirm to write the FAFP data. When Write Data is completed, tap OK and exit to the function menu. 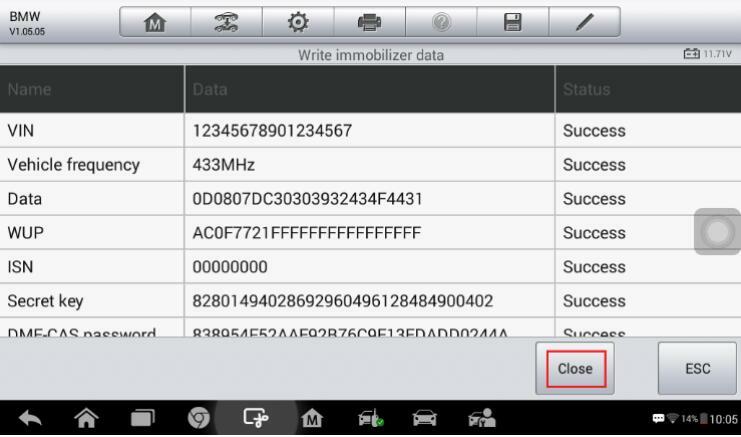 14.Tap Write immobilizer data to write the saved immobilizer data into the replacing module. Read the function information and tap OK to continue. 15.When a module menu displays, make selection accordingly. New Module: Perform this function if the replacing module is a brand new one. Used Module: Perform this function if the replacing module is a used one. 16.Select the saved immobilizer data file and tap Confirm to continue. 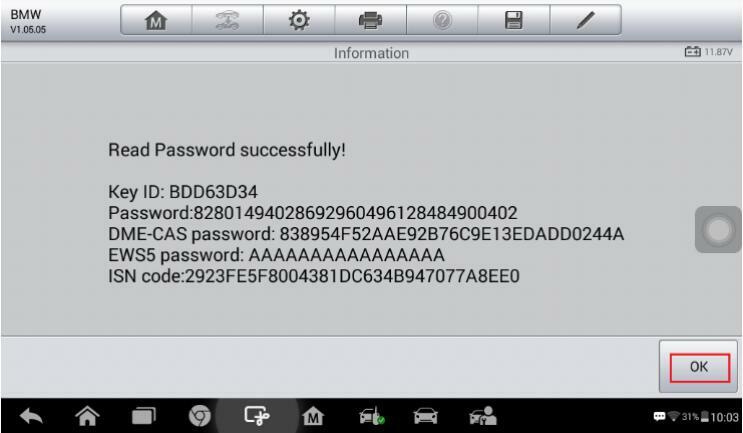 17.Tap Write data to ECU. When Write Data to ECU is completed successfully, tap Close and exit to the function menu. 18.Tap Repair coding to repair the coding of the new FEM/BDC module. Read the function information and tap OK to continue. 19.Tap Yes to continue the coding operation. 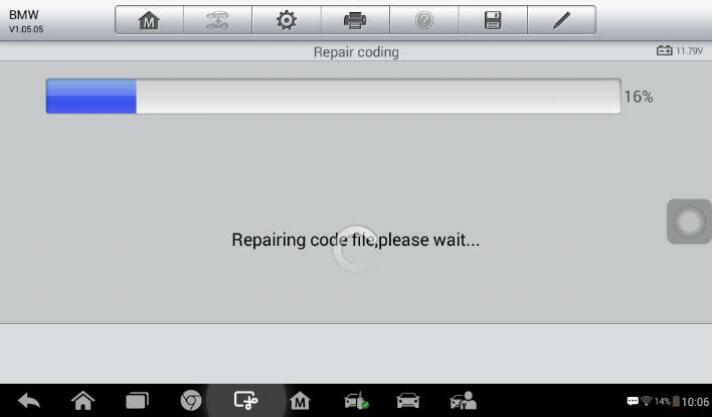 When Repair Coding is completed successfully, tap OK and exit to the function menu. 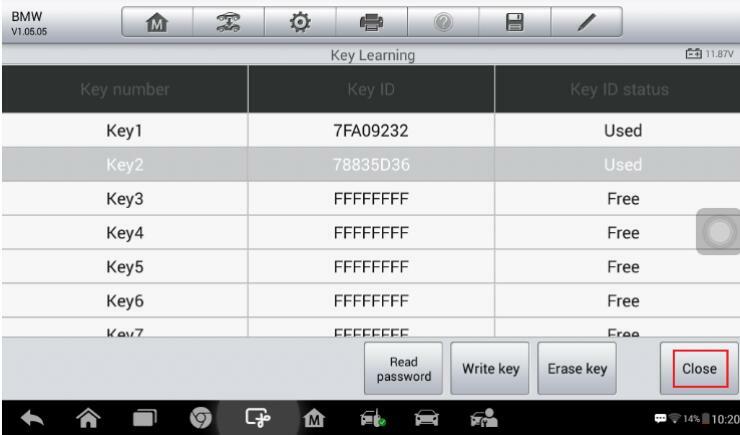 20.Tap Key learning to add a key to the new FEM/BDC module. Read the function information and tap OK to continue. 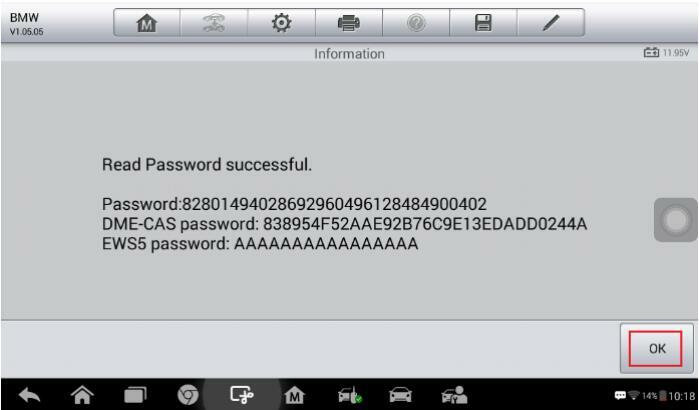 The password must be read out before the key can be written or cleared. A key position must be selected before the key can be written or cleared. 22.When a “Do you have a working key?” message displays, tap Yes and then put the original key close to the emergency start coil to read the password information, or tap No to input the engine ISN code. 23.Select a FREE key position and then tap Write key. 24.Follow the instruction to put the NEW key close to the emergency start coil and tap OK to start Key Learning. 25.When a “Write Key successful!” message displays, tap OK to check the key ID status. Then tap Close to exit to the function menu. 26.Tap Reset starter lock to reset the starter lock of the new FEM/BDC module. Read the function information and tap OK to continue. 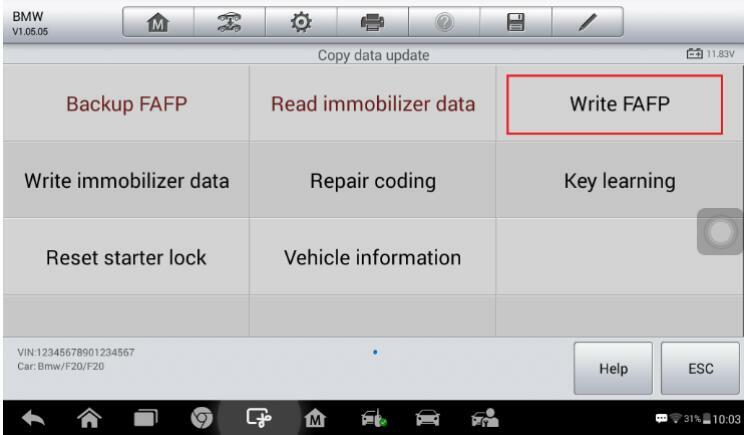 When this function is done successfully, Copy Data Update is completed. 27.Install the replacing FEM/BDC module into the vehicle and check if the engine can be started. DTCs may be detected and specific machines are needed for programming, coding and clear DTC. 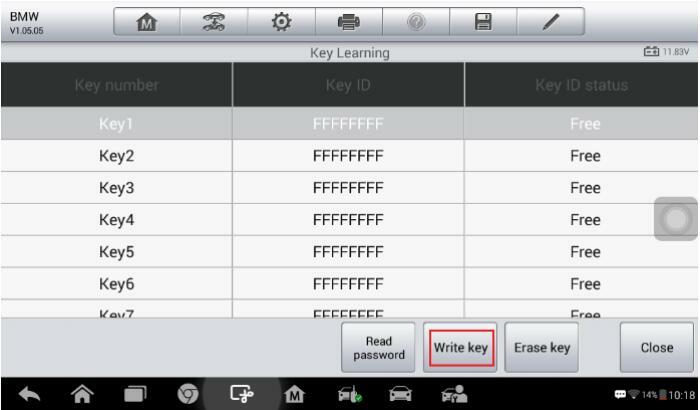 If the remote function of the original working key doesn’t work after the operation,please disable the key first and then enable it via Expert Mode > FEM/BDC > Key enabled/disabled. The newly added keys can be erased if you don’t need them. 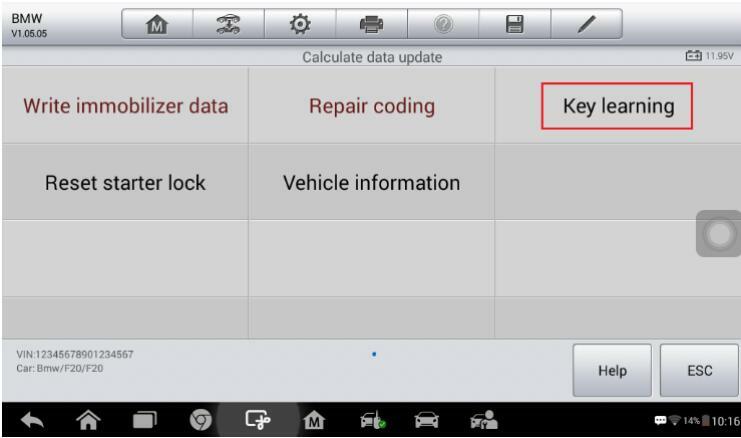 2.Attention: All original keys won’t be accepted when performing the Calculate Data Update function. 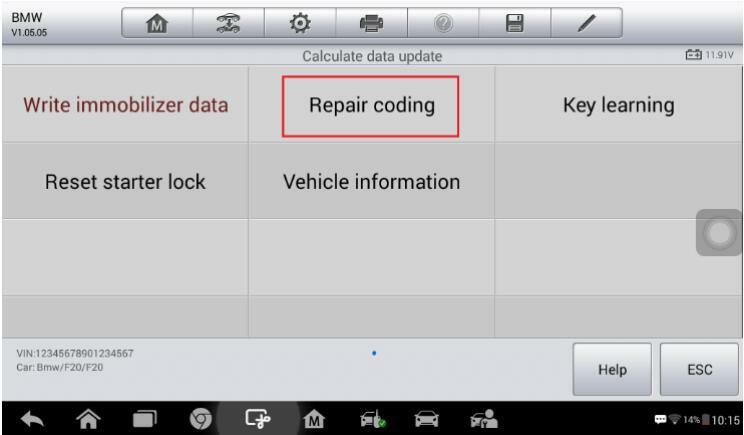 3.To perform the Calculate Data Update function, the VIN code, vehicle frequency and engine ISN code are needed. This information can be obtained via Expert mode. 4.The hardware version of the original and replacing modules can only vary slightly.Otherwise, the DTCs of the vehicle may not be cleared. 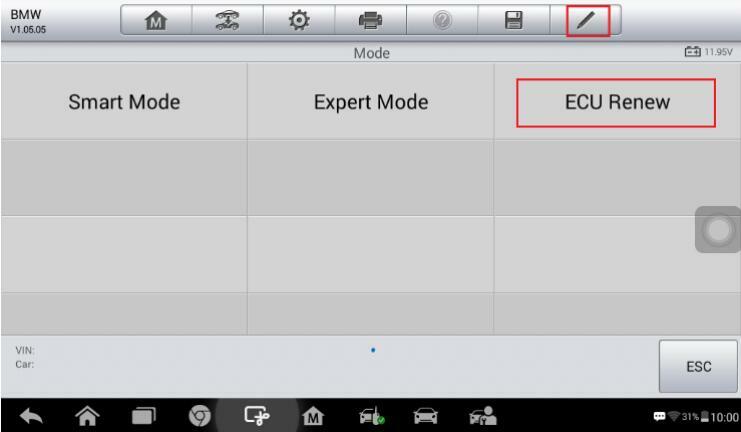 5.Remove the FEM/BDC module from the vehicle. 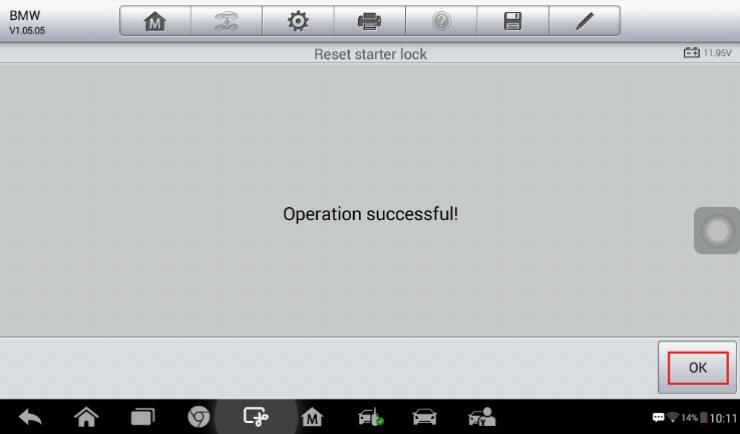 6.Conduct ECU preprocessing on the replacing (used) module and the original module to make them able to learn keys. 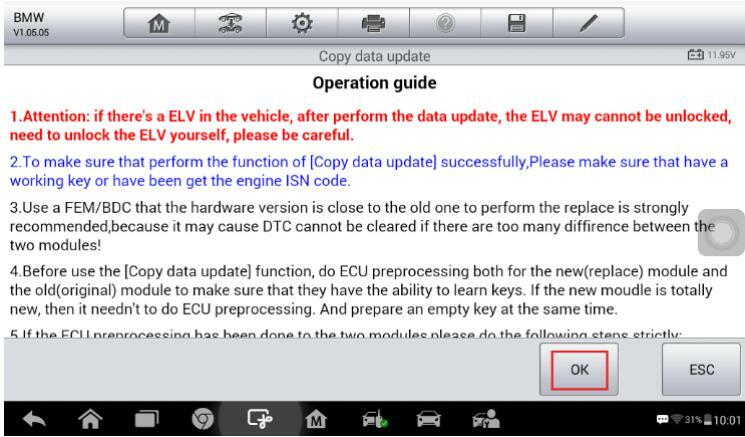 No ECU preprocessing is needed for the replacing module if it is a brand new one. 1.Connect the IM100 tablet to the replacing FEM/BDC module via the included main cable. Please make sure the engine is off before the operation gets started. 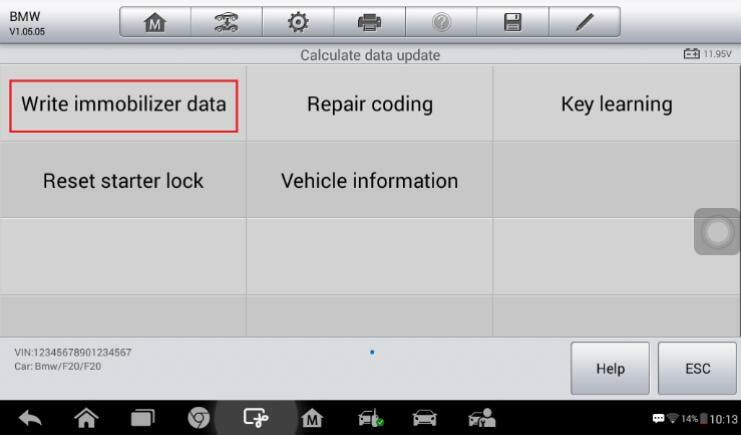 5.Tap Calculate Data Update, read the notes and procedures listed in the operation guide carefully, and then tap OK to continue. NOTE:If you don’t strictly follow the steps, the data may be lost or the FEM/BDC Renew operation may fail. 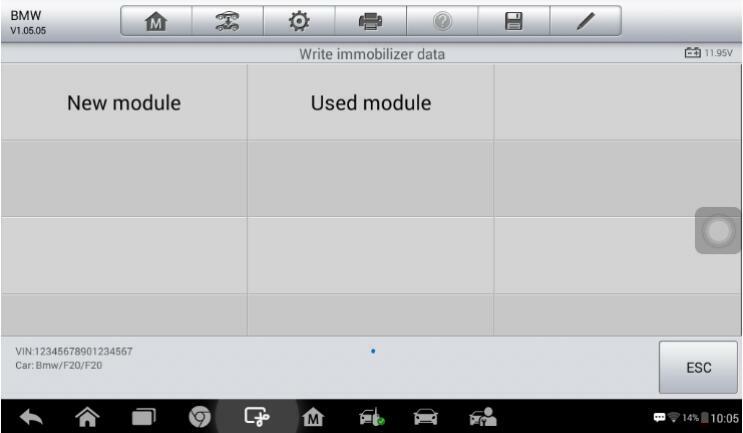 6.Tap Write Immobilizer data on the function menu to generate the immobilizer information and write it into the replacing FEM/BDC module. Read the function information and tap OK to continue. 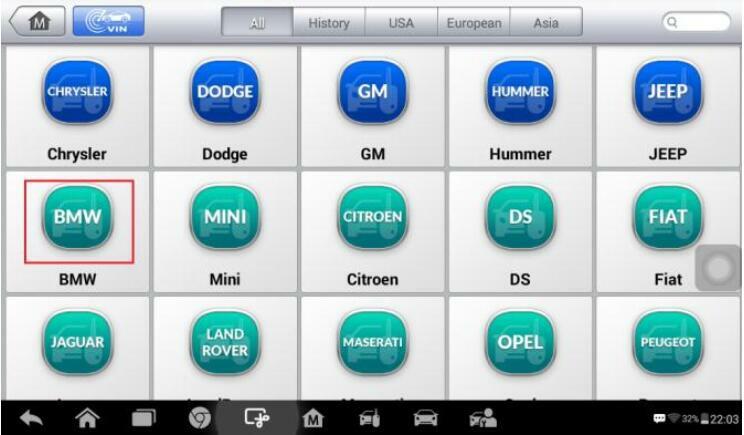 7.When a module menu displays, make selection accordingly. 8. 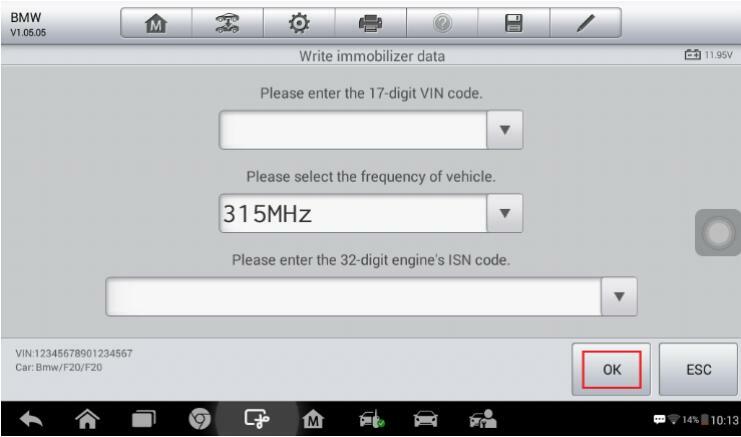 Input the VIN code, vehicle frequency and engine ISN code. Then tap OK to continue. 10. 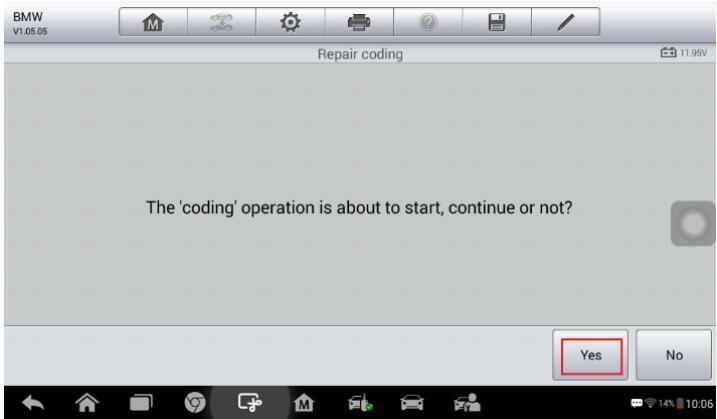 Tap Repair coding on the function menu to repair coding of the new FEM/BDC module. Read the function information and tap OK to continue. 11.Tap Yes to continue the coding operation. When Repair Coding is completed successfully, tap OK and exit to the function menu. 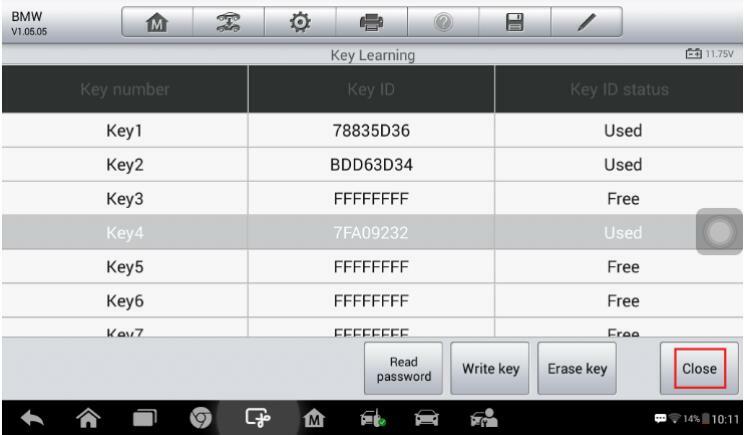 12.Tap Key Learning to add keys to the new FEM/BDC module. Read the function information and tap OK to continue. NOTE:All original keys can no longer be accepted. 16.Follow the instruction to put the NEW key close to the emergency start coil and tap OK to start Key Learning. 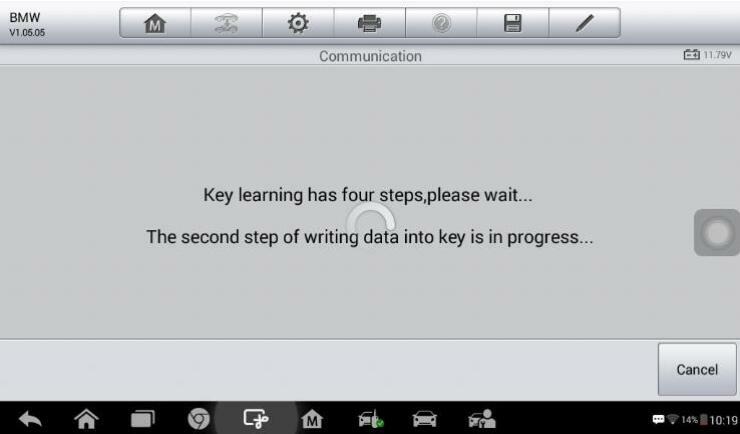 17.When a “Write Key successful!” message displays, tap OK to continue. 18.Repeat step 15-17 to learn the next key. 19.Check if two keys are successfully learned. Then tap Close to exit to the function menu. 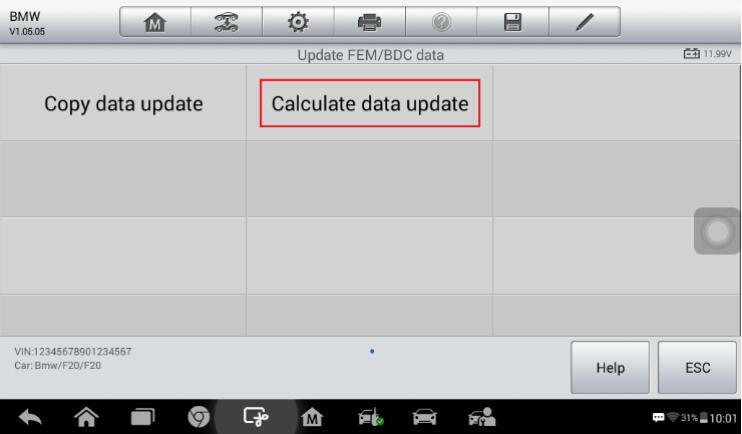 21.Install the new FEM/BDC module into the vehicle and check if the engine can be started. such as FAFP and integration level, and then to perform programming, coding and clear DTC.